We are back in studio finally with a new episode for you all! Stranger Things has returned to Netflix so let us return to the world of video stores and share our greatest memories of going to the store and renting those things called VHS tapes. Learn as we scanned the aisles for that new film to discover on a Friday night and how it helped influence us today and our love of film. We also get ready for Halloween and discuss the classic Universal Monsters of the 1930's and 40's and today's modern attempt to revitalize them that has failed so far for the studio. It's scary good fun that will even make a Mummy tremble! We also talk the latest trailers and news as usual and wait......there's more! 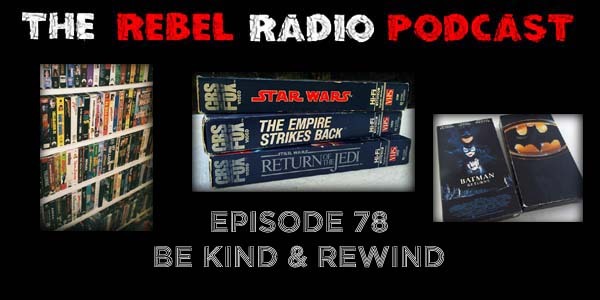 Stay tuned for a special announcement for the upcoming new direction of The Rebel Radio Podcast towards the shows end! Mark, Matt, and Frank are all here to take you down memory lane in the now wasteland that was video stores and the excitement of discovering a new film and more all in this brand new episode!